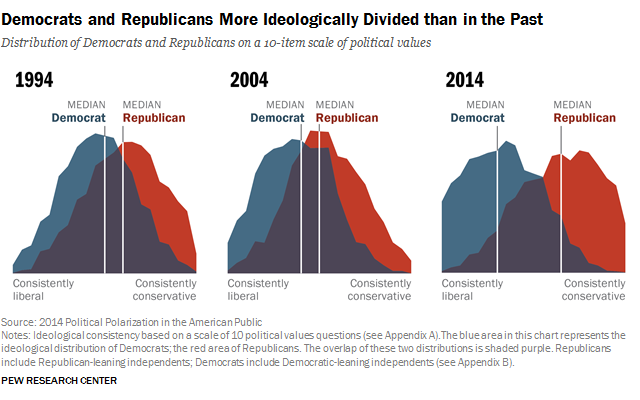 Republicans and Democrats are more divided along ideological lines – and partisan antipathy is deeper and more extensive – than at any point in the last two decades. These trends manifest themselves in myriad ways, both in politics and in everyday life. And a new survey of 10,000 adults nationwide finds that these divisions are greatest among those who are the most engaged and active in the political process. “Ideological silos” are now common on both the left and right. People with down-the-line ideological positions – especially conservatives – are more likely than others to say that most of their close friends share their political views. 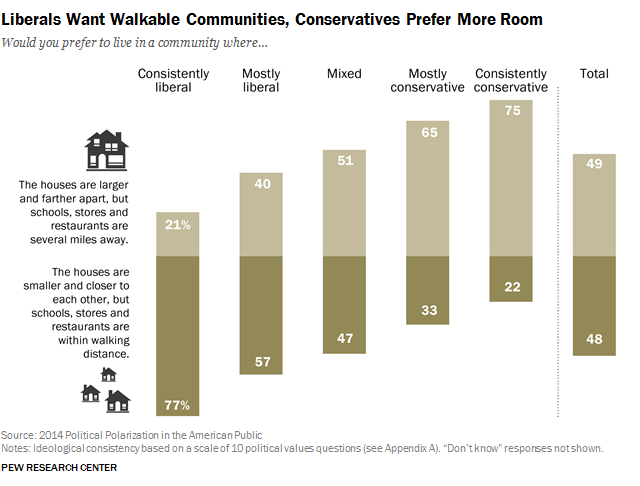 Liberals and conservatives disagree over where they want to live, the kind of people they want to live around and even whom they would welcome into their families. And at a time of increasing gridlock on Capitol Hill, many on both the left and the right think the outcome of political negotiations between Obama and Republican leaders should be that their side gets more of what it wants. These are among the findings of the largest study of U.S. political attitudes ever undertaken by the Pew Research Center. Data are drawn from a national telephone survey of 10,013 adults, conducted from January through March of this year, and an ongoing series of follow-up surveys. This rich dataset, coupled with trends and insights from two decades of Pew Research Center polling, reveals a complex picture of partisan polarization and how it manifests itself in political behaviors, policy debates, election dynamics and everyday life. 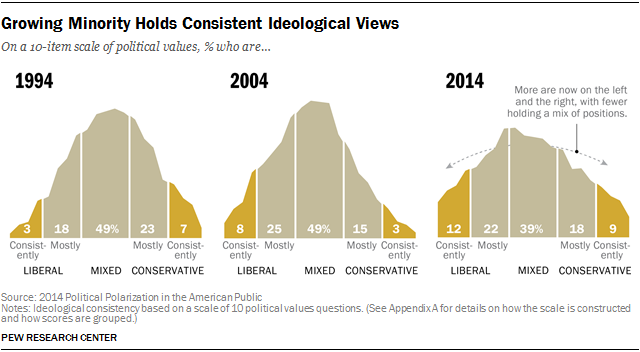 To chart the progression of ideological thinking, responses to 10 political values questions asked on multiple Pew Research surveys since 1994 have been combined to create a measure of ideological consistency. Over the past twenty years, the number of Americans in the “tails” of this ideological distribution has doubled from 10% to 21%. Meanwhile, the center has shrunk: 39% currently take a roughly equal number of liberal and conservative positions. That is down from about half (49%) of the public in surveys conducted in 1994 and 2004. And this shift represents both Democrats moving to the left and Republicans moving to the right, with less and less overlap between the parties. 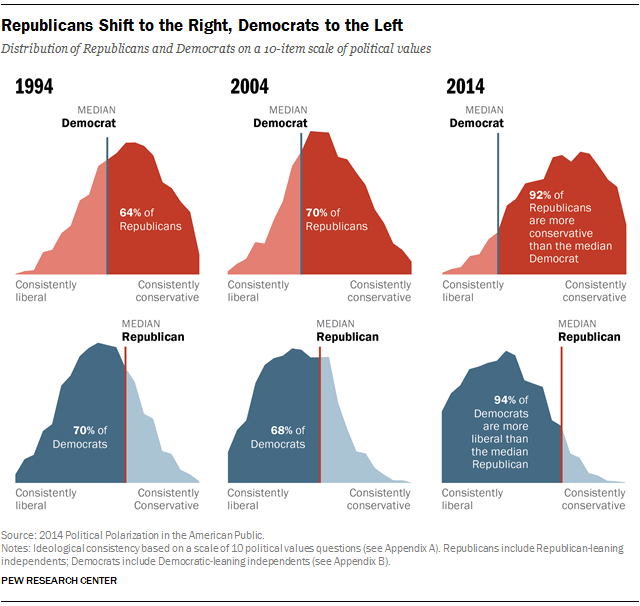 Today, 92% of Republicans are to the right of the median (middle) Democrat, compared with 64% twenty years ago. And 94% of Democrats are to the left of the median Republican, up from 70% in 1994. Beyond the rise in ideological consistency, another major element in polarization has been the growing contempt that many Republicans and Democrats have for the opposing party. To be sure, disliking the other party is nothing new in politics. But today, these sentiments are broader and deeper than in the recent past. In 1994, hardly a time of amicable partisan relations, a majority of Republicans had unfavorable impressions of the Democratic Party, but just 17% had very unfavorable opinions. 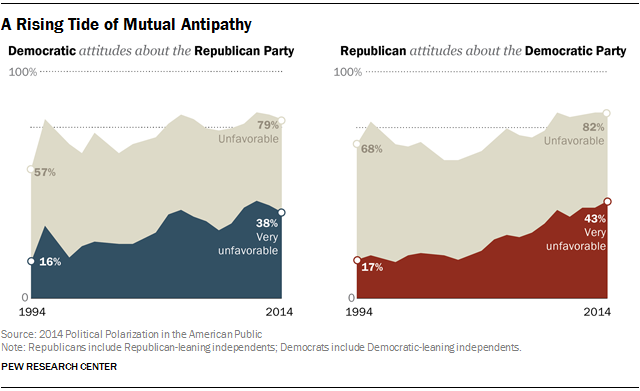 Similarly, while most Democrats viewed the GOP unfavorably, just 16% had very unfavorable views. Since then, highly negative views have more than doubled: 43% of Republicans and 38% of Democrats now view the opposite party in strongly negative terms. Among all Democrats, 27% say GOP policies are a threat to the well-being of the country; among all Republicans, more than a third (36%) think Democratic policies threaten the nation. Even these numbers tell only part of the story. Those who have a very unfavorable impression of each party were asked: “Would you say the party’s policies are so misguided that they threaten the nation’s well-being, or wouldn’t you go that far?” Most who were asked the question said yes, they would go that far. 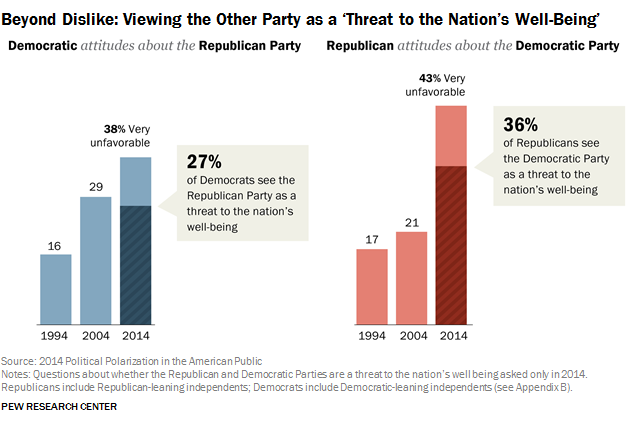 Among all Democrats, 27% say the GOP is a threat to the well-being of the country. That figure is even higher among Republicans, 36% of whom think Democratic policies threaten the nation. Liberals and conservatives share a passion for politics. They are far more likely than those with more mixed ideological views to discuss politics on a weekly or daily basis. But for many, particularly on the right, those conversations may not include much in the way of opposing opinions. 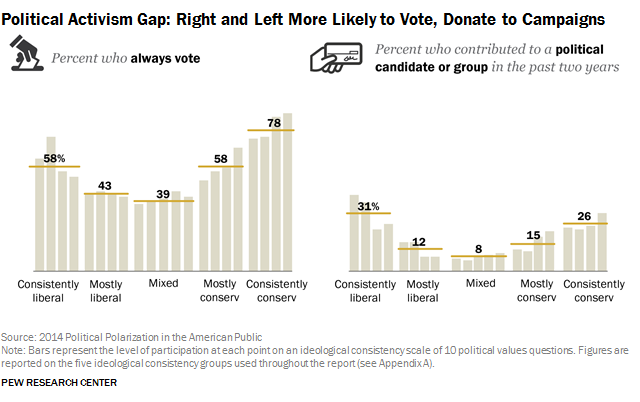 Nearly two-thirds (63%) of consistent conservatives and about half (49%) of consistent liberals say most of their close friends share their political views. 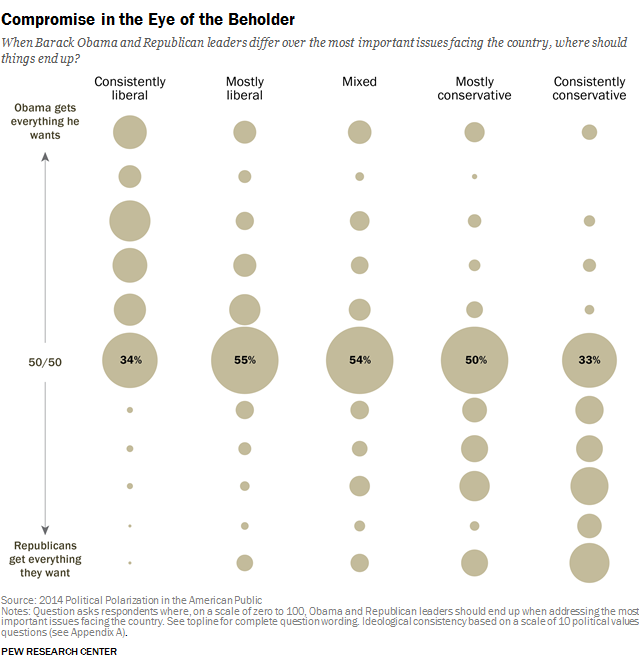 Among those with mixed ideological values, just 25% say the same. 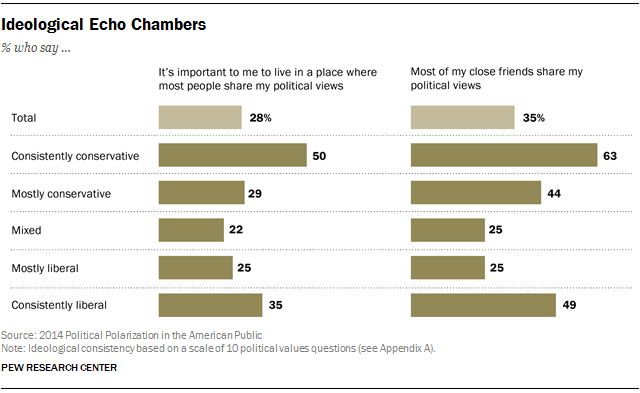 People on the right and left also are more likely to say it is important to them to live in a place where most people share their political views, though again, that desire is more widespread on the right (50%) than on the left (35%). And while few Americans overall go so far as to voice disappointment with the prospect of a family member marrying a Democrat (8%) or a Republican (9%), that sentiment is not uncommon on the left or the right. Three-out-of-ten (30%) consistent conservatives say they would be unhappy if an immediate family member married a Democrat and about a quarter (23%) of across-the-board liberals say the same about the prospect of a Republican in-law. To be sure, there are areas of consensus. Most Americans, regardless of their ideological preferences, value communities in which they would live close to extended family and high-quality schools. But far more liberals than conservatives think it is important that a community have racial and ethnic diversity (76% vs. 20%). At the same time, conservatives are more likely than liberals to attach importance to living in a place where many people share their religious faith (57% vs. 17% of liberals). When they look at a political system in which little seems to get done, most Americans in the center of the electorate think that Obama and Republican leaders should simply meet each other halfway in addressing the issues facing the nation. Yet an equitable deal is in the eye of the beholder, as both liberals and conservatives define the optimal political outcome as one in which their side gets more of what it wants. A majority of consistent conservatives (57%) say the ideal agreement between President Obama and congressional Republicans is one in which GOP leaders hold out for more of their goals. Consistent liberals take the opposite view: Their preferred terms (favored by 62%) end up closer to Obama’s position than the GOP’s. The signs of political polarization are evident on both ends of the political spectrum, though the trajectory, nature and extent differ from left to right. With Barack Obama in the White House, partisan antipathy is more pronounced among Republicans, especially consistently conservative Republicans. Overall, more Republicans than Democrats see the opposing party’s policies as a threat and the differences are even greater when ideology is taken into account. Fully 66% of consistently conservative Republicans think the Democrats’ policies threaten the nation’s well-being. By comparison, half (50%) of consistently liberal Democrats say Republican policies jeopardize the nation’s well-being. Conservatives also exhibit more partisan behavior in their personal lives; they are the most likely to have friends and prefer communities of like-minded people. However, there is as much ideological uniformity on the left as the right. 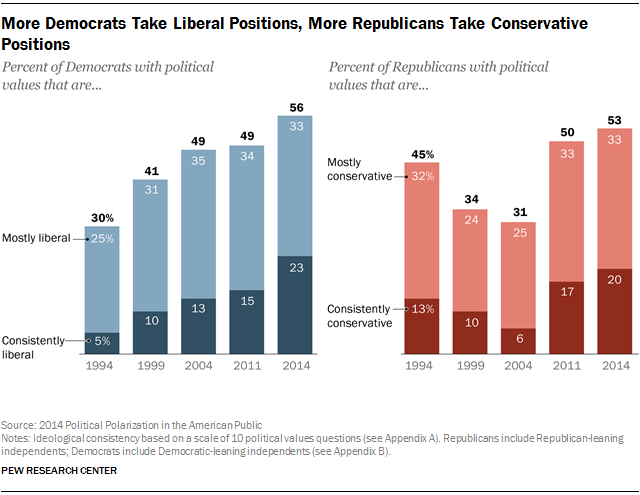 The share of Democrats holding consistently liberal views has grown steadily over the past 20 years, quadrupling from 5% in 1994 to 23% today. Social issues like homosexuality and immigration that once drove deep divides within the Democratic Party are now areas of relative consensus. And Democrats have become more uniformly critical of business and more supportive of government. Changes in ideological consistency on the right have followed a different course. In 1994, during the “Republican Revolution,” 13% of Republicans were consistent conservatives. That figure fell to 6% a decade later during George W. Bush’s presidency, before rebounding to 20% today. This increase has come despite more moderate views among Republicans on issues like homosexuality and immigration, as GOP thinking on issues related to government and the economy has veered sharply to the right. This is the first report of a multi-part series based on a national survey of 10,013 adults nationwide, conducted January 23-March 16, 2014 by the Pew Research Center. The survey, funded in part through grants from the William and Flora Hewlett Foundation, the John D. and Catherine T. MacArthur Foundation and supported by the generosity of Don C. and Jeane M. Bertsch, is aimed at understanding the nature and scope of political polarization in the American public, and how it interrelates with government, society and people’s personal lives. The second report, coming in a few weeks, is the new Pew Research Center Political Typology. The typology – the sixth such study since 1987 – looks beyond Red vs. Blue divisions to gain a clearer understanding of the dynamic nature of the “center” of the American electorate, and the internal divides on both the left and the right. Later, the project will explore the various factors that contribute to political polarization, or stem from it. A September report will examine how political polarization is linked to people’s information environments: Their news sources, social media habits and interpersonal communication networks. Other reports will look at how political polarization relates to where people live, to their political environments, to how they view themselves and others around them, to their socioeconomic circumstances, to generational changes and to broader sociological and psychological personality traits. The current report is divided into five parts: The first two focus on measuring the nature and scope of political polarization, emphasizing the difference between growing ideological consistency and rising partisan antipathy. The third looks closely at how polarization manifests itself in people’s personal lives. The fourth looks at the relationship between polarization and practical policymaking, and the fifth digs deeper into how political participation both amplifies and reflects polarization. The data in this report are based on two independent survey administrations with the same randomly selected, nationally representative group of respondents. The first is the center’s largest survey on domestic politics to date: the 2014 Political Polarization and Typology Survey, a national telephone survey of 10,013 adults, on landlines and cell phones, from January through March of this year. The second involved impaneling a subset of these respondents into the newly created American Trends Panel and following up with them via a survey conducted by web and telephone. The two surveys are described separately, in further detail, in the About the Surveys section of the report.